This group is simpler, it’s all about stocks. Equities shares from around the world to be precise. But what to buy? As I said before I wasn’t a great stock picker so I decided to buy them all. Equities ETFs from different parts of the world were the answer. This allowed me to be diversified by region, sector, market cap and currency, in a way I never imagined that I would have enough funds to do it so. Those ETFs reply global indexes and therefore through one ETF you can have the best 500 companies of Europe, for example. It’s easy to decide what ETFs to have because you can divide the world in regions and buy ETFs that have companies from those regions. This means you can have ETFs from North America, South America, Europe, Oceania, Asia and Africa. World regions also can be divided into developed and emerging economies, where in first group you have North America, Europe and Asia Pacific (Oceania plus Japan, Hong-Kong, Singapore, South Korea). Countries with emerging economies are normally found in the rest of Asia, South America and Africa. Developed countries tend to give smaller return than emerging economies, because it’s more difficult to have big growth in mature economies but they also represent less volatility to your portfolio. Of what I’ve read and learnt the majority of portfolios have separate allocations for North America, Europe and Asia Pacific, but normally choose only one ETF for emerging countries. Which makes senses, because some regions doesn’t have enough countries with minimum conditions to have proper stock exchanges. Therefore I also opted for one ETF that includes the most important companies of emerging countries. The ETFs of this region represent two of the biggest economies in the world, USA and Canada. The ETF should track a free float-adjusted market capitalization weighted index which is designed to measure the equity market performance of the North America. It is possible to choose an equal weighted ETF, which will give same value to all the companies in the index, but I prefer a weighted one because is closer to reality and that for me is reassuring (although it’s possible that equal weighted ETFs have better performance). 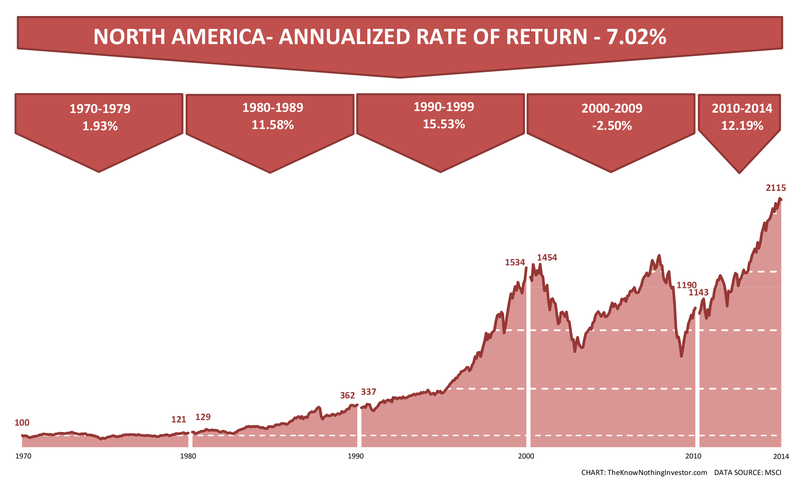 Many portfolios prefer only to have stocks from US without Canadian ones. The Old Continent is not doing so well in recent years, but it is home of inumerous development economies such as Germany, United Kingdom and France. 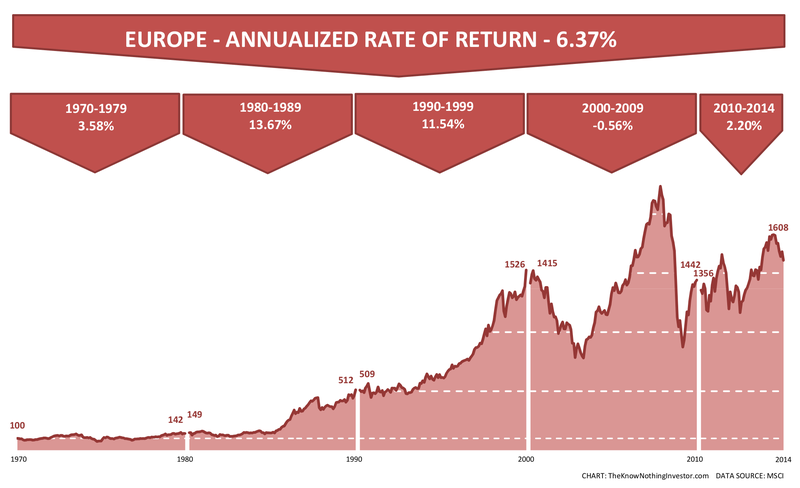 The european ETF should also track a free float-adjusted market capitalization weighted index that represents the equity market performance of the developed markets in Europe. Besides those countries, a european ETF normally also have stocks from these markets: Austria, Belgium, Denmark, Finland,, Ireland, Italy, the Netherlands, Norway, Portugal, Spain, Sweden and Switzerland. 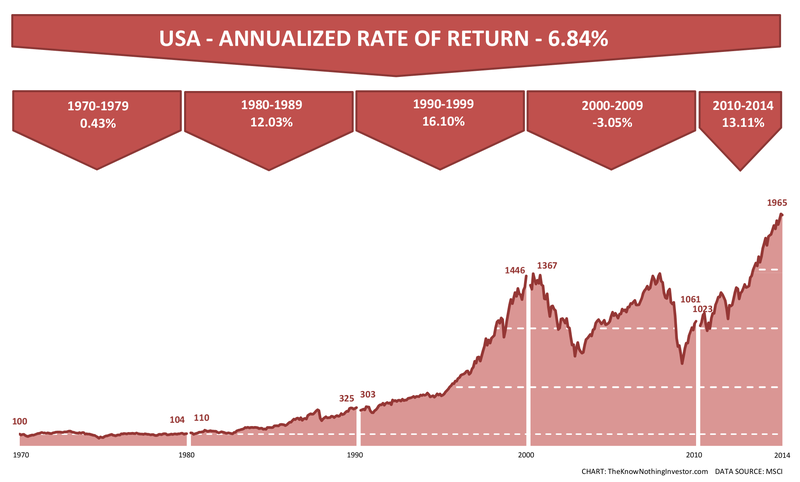 Great rate of returns come with high volatility. Although these countries have great potential for economic growth is also true that what would be a small problem in developed countries can be a major crises in emerging markets. 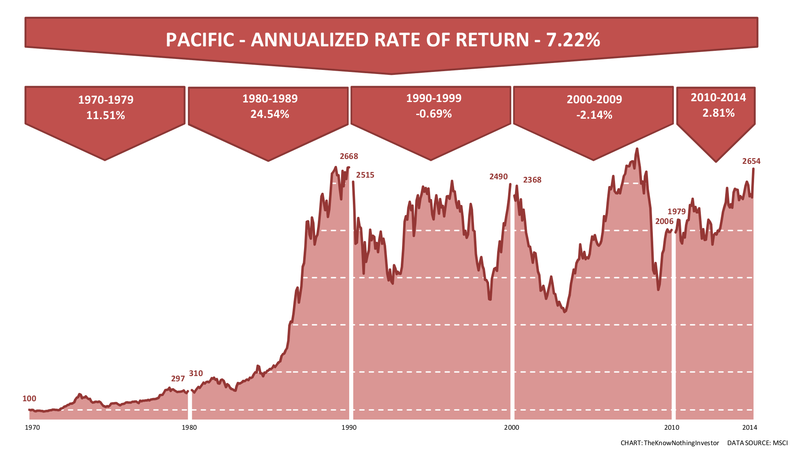 Once more it’s important to choose a passive ETF that seeks to replicate an emerging market index. The index will represents the equity market performance of emerging markets. Emerging indexes normally follow these countries: Brazil, Chile, China, Colombia, Czech Republic, Egypt, Greece, Hungary, India, Indonesia, Korea, Malaysia, Mexico, Peru, Philippines, Poland, Qatar, Russia, South Africa, Taiwan, Thailand, Turkey and United Arab Emirates. These are the regions that through ETFs it’s easy to be exposed to. Equities shares with geographic diversification should have the biggest chunk in your portfolio. They will give a boost to your account’s value when world economy is doing good. 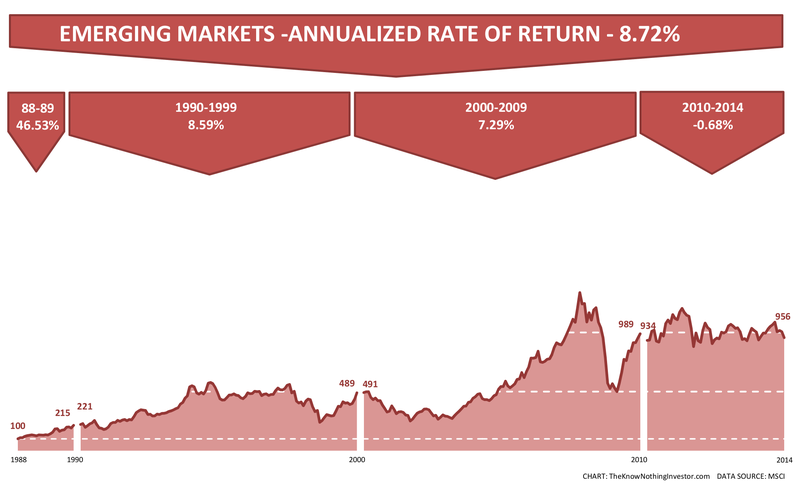 The rates of return mentioned in the charts don’t include rebalancing, so adding new money over years will for sure improve those returns and for my taste they are quite interesting.